The main objective of the Mexican festival Movimiento en Movimiento is to look for possibilities between narrative, deep meanings, dance and audiovisual media, through the exhibition of a series of exceptional works to disseminate the genre screendance and dance film, it is dance and technology. Movimiento en Movimiento does not only show pieces of dance or visual beauty, but aims to take us back to the moment when the images “generated surprise” and “meant something”, trying to escape from the present era of total confusion in which images are used for whatever reason and abound in generalized nonsense. Thus, showing a collection of great diversity in styles, Movimiento en Movimiento has collected in its Permanent Gallery a set of heterogeneous works which have in common the clearness of meaning, solid senses, narrative and emotional depth. Movimiento en Movimiento gives priority to works that have some relation with literature and philosophy, however the thematic possibilities are quite diverse. Edition number 1: “Eleven creations for the screen – Eleven coincidences”. April 19th, 2013. Talk: Reflections on creation in screendance. Museo del Chopo. Mexico City. Edition number 2: “A sight towards different frames”. November 8th, 2013. Talk: Limits, influences and sense of screendance. Museo del Chopo. Mexico City. Edition number 3: “Gestural stories”. September 29th to October 4th, 2014. Workshop From the draft to the screen, by Ella Fiskum. Museo del Chopo. Mexico City. Edition number 4: “The fall in the body”. October 14th, 2015. SOMA. Mexico City. Edition number 5: “Audiovisual polygraphs”. November 24th and 25th, 2016. Sala de Arte Público Siqueiros. Mexico City. Edition number 6: “Biographies and dynamic realities”. November 21st to 25th, 2017. Centro de Culltura Digital. Mexico City. Each year, the festival makes its premiere in a venue open to the public and later the works are collected in the Festival’s Permanent Gallery. 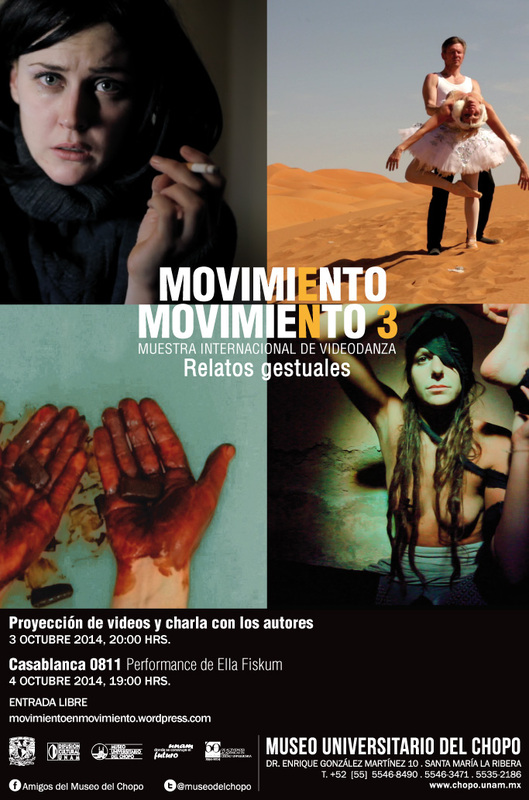 A similar festival was held in Berlin in 2008, it was an initiative by the director of Movimiento en Movimiento in complicity with Jenny Haack. 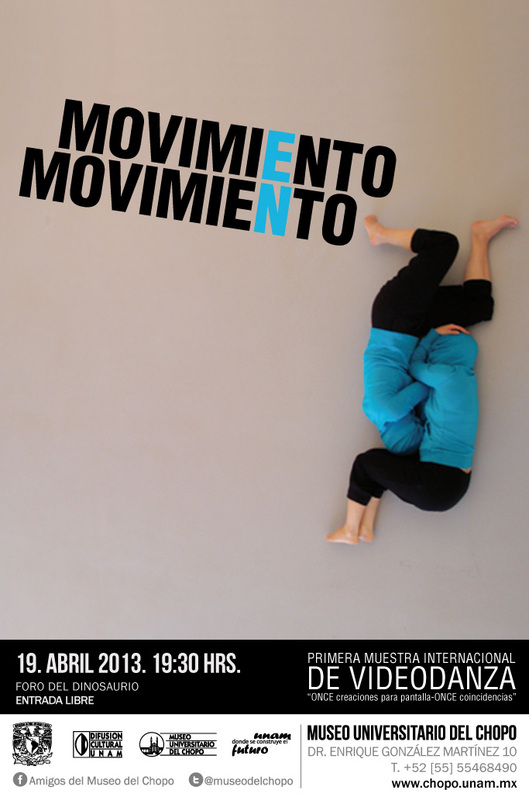 This background festival was named MOTION and had very similar principles to the Mexican festival Movimiento en Movimiento. 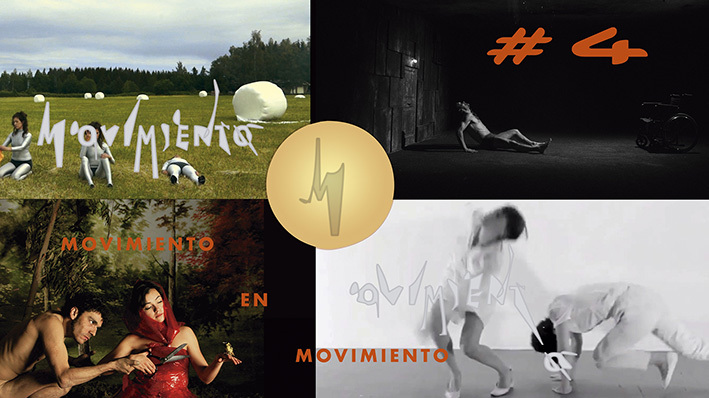 Movimiento en Movimiento became, since 2016, an active member of REDIV (Iberoamerican Videodance Network), which is formed by 14 active Ibero-American festivals and other 5 adherent festivals, this network has been organized to carry out joint actions of diffusion of screendance, a common Web page, a REDIV award, screenings, and several more mutual support and dissemination actions. Yolanda M. Guadarrama (Director), Lucitzel Pedrozo Lara (Creator y academic on screendance), Nayeli Benhumea (Creator and screendance critic), Alejandro Valenzuela, Iván Bueno, Norma Fadanelli, María Gracia Velázquez, Réka Szüks, Madeline Wood, Anna Macdonald, Karina Sosa, P.R. Wenceslao Bruciaga. Yolanda M. Guadarrama (https://www.yolandamguadarrama.com), director of Movimiento en Movimiento, has several years of experience in the field of screendance, she made her first screendance work in 1994, she has been a jury of Screendance at the LIFF festival in England, now she is completely dedicated to the creation and dissemination of this artistic genre, writing texts, teaching courses, making her own creations, promoting the festival she directs, etc. Yolanda has also been curating RIFF festival in Norway (R.E.D. International Film Festival) for 4 years, a festival dedicated to dance, art and cinema. It was founded by Ella Fiskum and Yolanda M. Guadarrama.